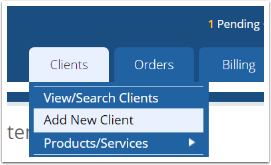 This guide shows how to manually add a client to WHMCS. For example if the client pre-dates your use of the WHMCS software, or you wish to place an order on their behalf. Fill out the clients details. Click the Add Client button.